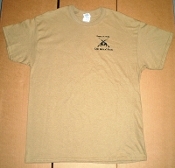 Grab a T-shirt to show your DEZ Tactical support! Front displays crossed guns with 'Custom AR Rifles' and 'DEZ Tactical Arms' printing. Back displays our logo along with slogan 'Be Legend Worthy'! Gildan 100% cotton pre-shrunk. Sizes are standard.